Something you know (ex. account password, banking PIN). Something you have (ex. a mobile phone or ATM card). Something you are (ex. a fingerprint or voice print). Responding to a push notification sent to the Duo Mobile app on your mobile phone (CTS recommended method). Entering a one-time passcode you generate in the Duo Mobile app or with a Duo hardware token device. Answering a phone call to a mobile or landline phone and following prompts to verify your login. You can choose which Duo authentication method you prefer each time you log in. Accessing VPN resources via Global Protect. Signing in to any Shibboleth-supported web applications (Box, ChromeRiver, Slate, and others). 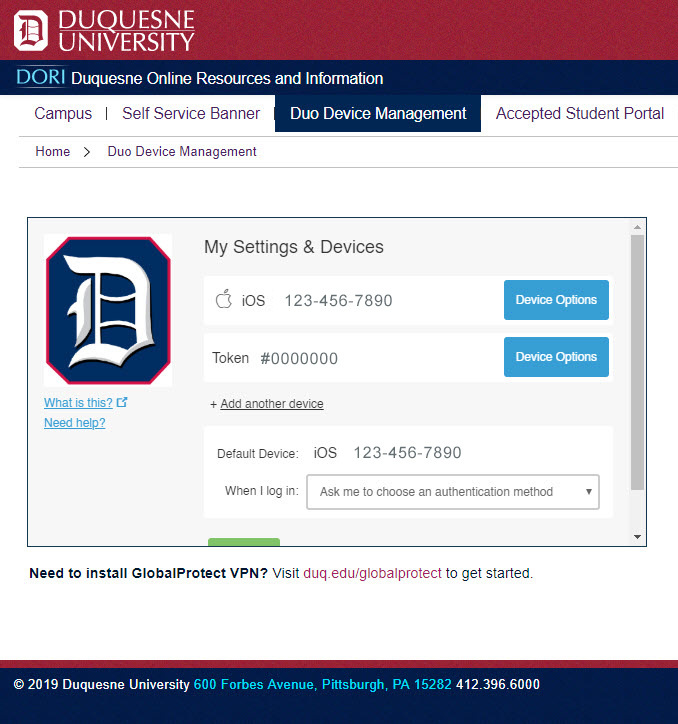 For a complete list of 2FA-enabled web applications, please visit duq.edu/authentication. When signing in to Shibboleth-supported web applications, you will only need to complete a MFA log in with Duo once every 12 hours. Note: If you are enrolling a mobile phone in Duo, please visit either the App Store (iPhone) or Google Play Store (Android) and download the Duo Mobile app before proceeding. Click the Duo Device Management tab. Click Start Setup to begin the enrollment process. Select the type of device you are enrolling (mobile phone, tablet, landline phone, or U2F token) and click Continue. CTS strongly encourages users to enroll their mobile phone with Duo. Select the appropriate make and model of your device and click Continue. A push notification will be sent to your newly-enrolled device. Click Approve to complete enrollment. Select your desired authentication method to proceed (CTS recommends selecting Send Me a Push). Reactivate Duo Mobile: Sends a new authentication push to the selected device. Change Device Name: Allows you to modify the device name. Delete Device: Un-enrolls the selected device with Duo (you will no longer receive push notifications to that device). For additional instructions on enrolling and managing devices with Duo Security, click here.